It’s amazing what smartphones can do these days! 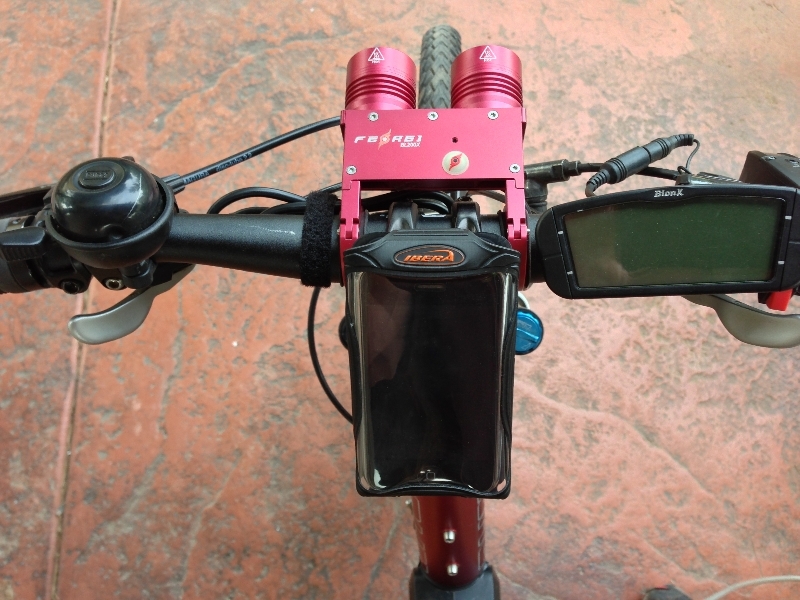 One of the new trends is to mount your smartphone to the handlebars of your bike and use one of the many smartphone bike applications that are available to provide you with traditional cycle computer info and GPS tracking. Plus, in many cases you can share this info with your friends! To jump into this new trend I tested the Ibera PB9 Smartphone Case and the 3 different mounting systems that Ibera offers with my iPhone. The PB9 is a versatile smartphone case because it can fit so many different phones; some even with their protective cases installed. You will need to measure your phone to make sure and compare to the specs. If you are really tight on space you could remove the interior felt pad of the case to free up a little more room , but it does take away some of the case’s structural integrity. 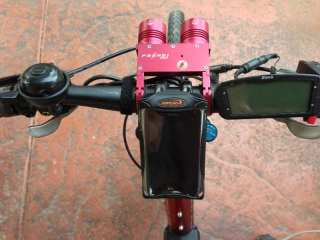 In addition to fitting many different smartphones, the PB9 can fit many different bike configurations. A center stem mount option. 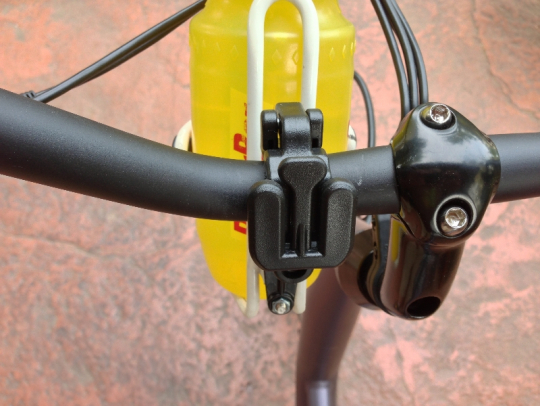 A handlebar mount with a water bottle cage adapter option. And a handlebar mount with an additional bar to install other accessories. Another cool feature is that the PB9 can be installed in either portrait or landscape orientation. Landscape with center stem mount. 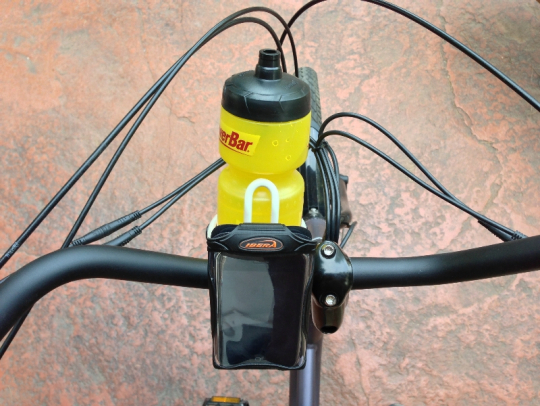 Portrait with handlebar water bottle mount option. 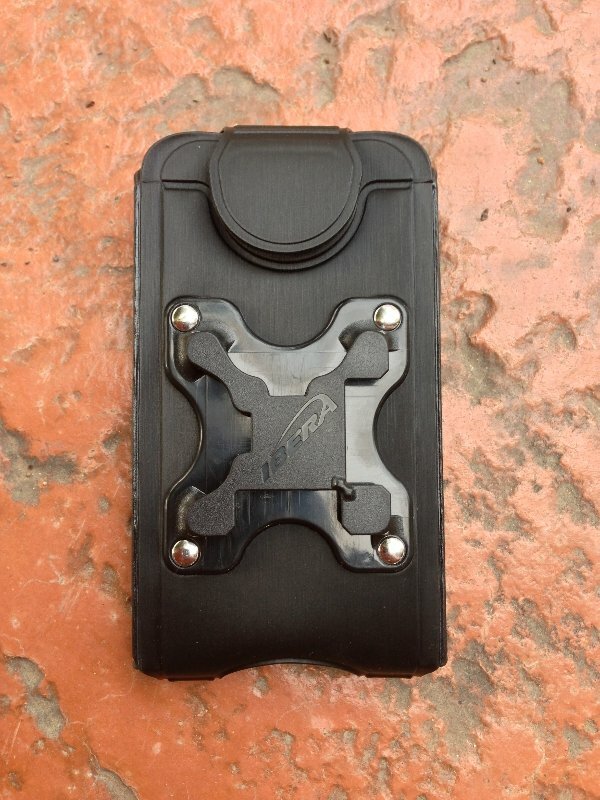 The attachment clip on the back of the Ibera PB9 Smartphone Case. Here’s a video demonstrating the different mount options shown on the Juiced Riders ODK, the Evelo Luna, and the Ohm XS750. Installing or removing the phone from the case is very easy thanks to the velcro tab on top of the case. If you want to take the case with you, it is pretty easy to unclip it from any of the mount options. The PB9 is not waterproof but it does protect the phone from some moisture (sweat) and dust and/or dirt. The front cover of the case allows you to still use your finger gestures to control your phone with ease. I was using the iPhone and its home button was covered slightly by the lower part of the case’s front cover. It just required a little extra pressure to activate the home button. In direct sunlight there can be a bit of glare from the case’s front covering but the angle of the case can be adjusted to minimize that. I also turned my iPhone’s brightness up all the way and cleaned the case’s front cover now and then. Some smartphones have the headphone jack on the bottom of the phone (iPhone 5) and the case doesn’t provide a specific opening for that. Although, with my iPhone 5 I was able to move the phone to the right in the case and plug in the headphone jack in the center opening of the case. 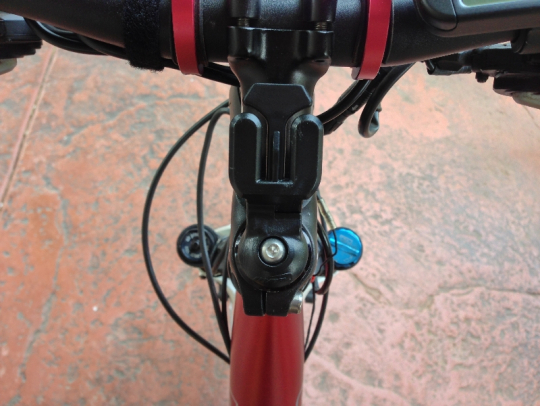 A note about headphones: I would not recommend listening to your headphones while riding! Some people want to plug in speakers that are mounted to their handlebars. Using the iPhone 5 I was able to hear my music pretty well just from the iPhone 5 speaker. The Ibera PB9 is pretty affordable! At the time of this review it was $21.99 to $24. 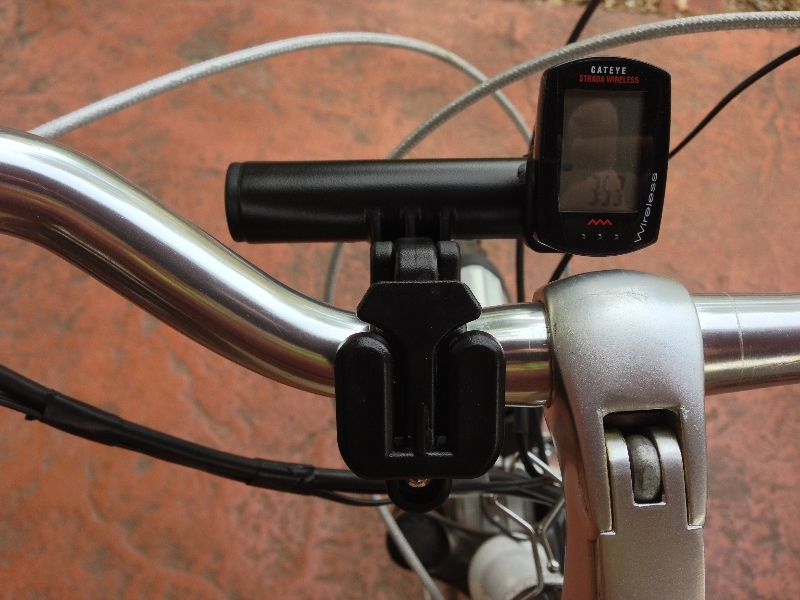 Overall the Ibera PB9 provides an economical way to use your smartphone on your electric bike. 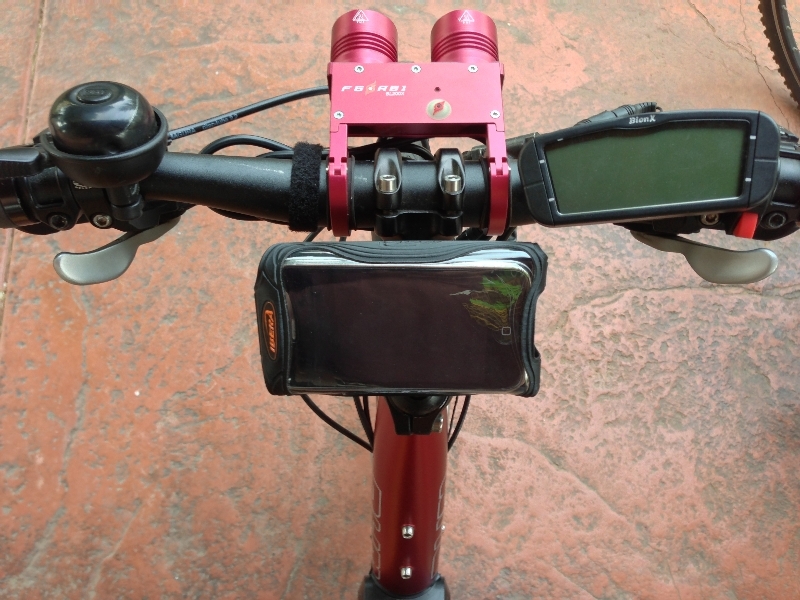 With all the apps that are available, a smartphone and the Ibera PB9 case can be a good alternative to having a traditional cycle computer.